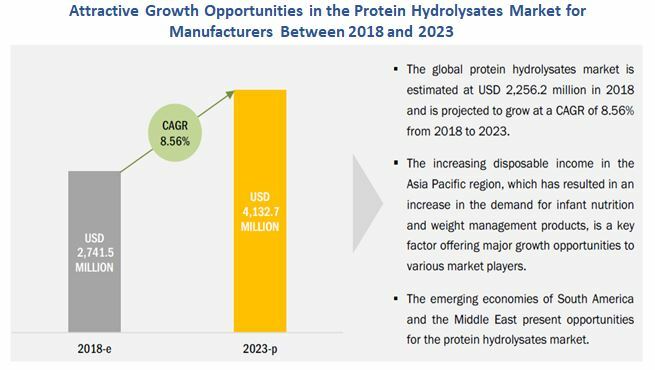 [170 Pages Report] The global protein hydrolysates market was valued at USD 2.53 billion in 2017 and is projected to reach USD 4.13 billion by 2023, at a CAGR of 8.56% during the forecast period. Growth in the market can be attributed to the increasing demand for nutritional food and growing health consciousness among consumers. The global protein hydrolysates market has been segmented on the basis of type, source, process, application, form, and region. On the basis of region, the market has been segmented into North America, Europe, Asia Pacific, and Rest of the World (RoW). The objectives of the report are to define, segment, and project the size of the global protein hydrolysates market with respect to the above-mentioned segmentations and provide a detailed study of key factors influencing the growth of the market, along with profiling the key players in the market and their core competencies. This report includes estimations of market sizes for value (USD million) with the base year as 2017 and forecast period from 2018 to 2023. The top-down and bottom-up approaches were used to estimate and validate the size of the protein hydrolysates market and to estimate the size of various other dependent submarkets. Key players in the market have been identified through secondary such as the Food and Drug Administration (FDA), Food Standards Australia New Zealand (FSANZ), Food Safety and Standards Act of India (FSSAI), and their market share in respective regions has been determined through primary and secondary research. All percentage shares, splits, and breakdowns have been determined using secondary sources and were verified through primary sources. The key players in the protein hydrolysates market are Abbott Laboratories (US), Koninklijke DSM N.V. (Netherlands), Kerry Group plc (Ireland), FrieslandCampina (Netherlands), Arla Foods (Denmark), Tate & Lyle plc (UK), Archer Daniels Midland Company (US), Glanbia plc (Ireland), Danone Nutricia (Netherlands), AMCO Proteins (US), and Hilmar Ingredients (US). Further breakdown of the Rest of Asia Pacific protein hydrolysates market into India, ASEAN countries, and South Korea. The protein hydrolysates market is projected to grow at a CAGR of 8.56%, to reach USD 4.13 billion by 2023, from USD 2.74 billion in 2018. The multi-functional nature of protein hydrolysates, ease of incorporation in a wide range of applications, increase in demand for high-protein food, and increased consumption of premium products are the factors driving the market. Increase in awareness with regard to the importance of nutritional food and their rising applications among the global population, fuel the demand for food emulsifiers. 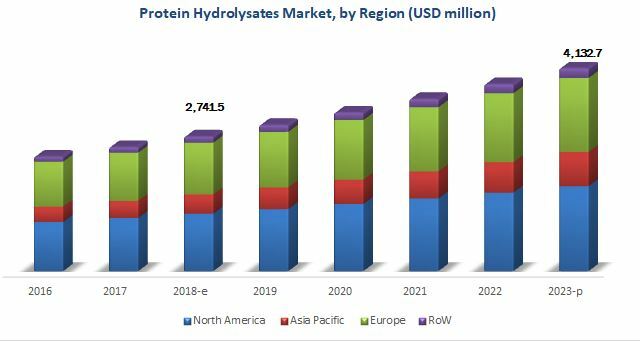 The protein hydrolysates market, by type, has been segmented into milk protein hydrolysates, plant protein hydrolysates, animal protein hydrolysates, marine protein hydrolysates, egg protein hydrolysates, and yeast protein hydrolysates. Milk protein hydrolysates have emerged as the most widely used type owing to their multi-functional properties and their vast application in infant formula, clinical nutrition, and weight management. Based on source, the animal segment is estimated to have the largest market share in 2018. Factors such as high protein content in animal sources such as milk are drivers for this segment in the protein hydrolysates market. The protein hydrolysates market, on the basis of application, has been segmented into infant nutrition, clinical nutrition, weight management, and animal feed. Protein hydrolysates have been gaining importance in the infant nutrition segment because of growing concerns about milk allergy/lactose intolerance in infants, which drives the demand for low-lactose, high-protein infant nutrition products. The North America region is estimated to account for the largest share of the global protein hydrolysates market, in terms of both value and volume, in 2018. Consumer preference for healthy and premium food ingredients is the major growth driving factor for this market share. Protein hydrolysates require high investment for innovations and product development, which increases their production cost. Protein hydrolysates from similar sources offering similar functionalities are facing competition due to technological advancements and cost efficiency. This is the major growth restraining factor for the global protein hydrolysates market. The leading players that dominated the protein hydrolysates market include Abbott Laboratories (US), Koninklijke DSM N.V. (Netherlands), Kerry Group (Ireland), FrieslandCampina (Netherlands), and Arla Foods (Denmark). These key players have been exploring the market in new regions by adopting acquisitions, expansions, investments, new product launches, agreements, and joint ventures as their preferred strategies. They have been investing in intensive R&D activities and also adopting expansions and acquisitions as a mode to enhance their product offerings and capture a larger market share, thus increasing the demand for protein hydrolysates. *Details on Business Overview, Products Offered, Recent Developments, SWOT Analysis and MnM View Might Not Be Captured in Case of Unlisted Companies.